To finish off the second week of the new format, let’s read something fun. 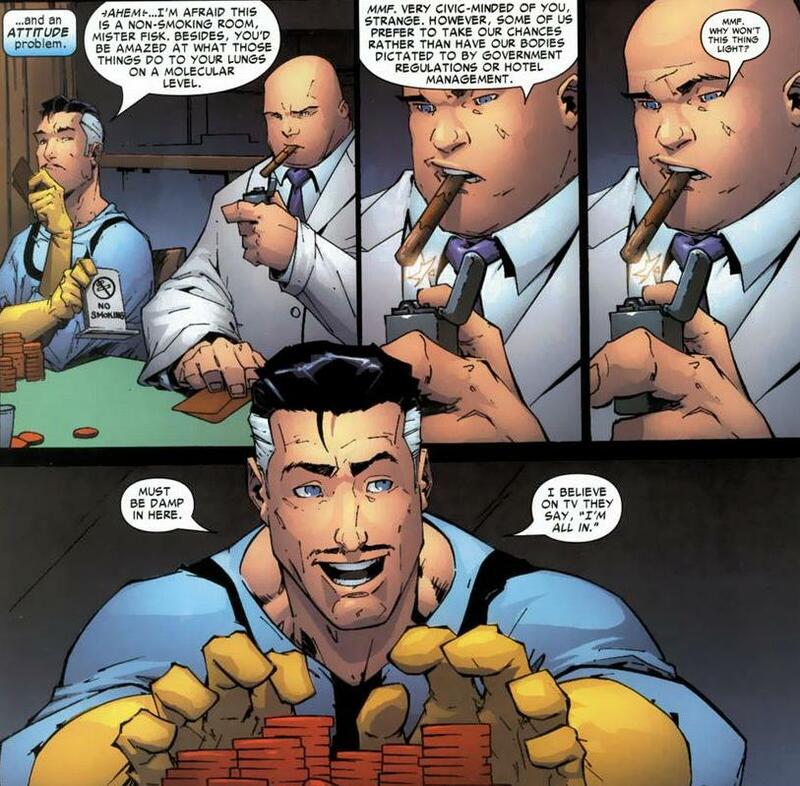 What do superheroes do when they’re not superhero-ing? They have to have hobbies, right? I mean, not Hawkeye because he’s on like eight teams, but the others must have some downtime. Well, they aren’t knitting. Late night poker games! 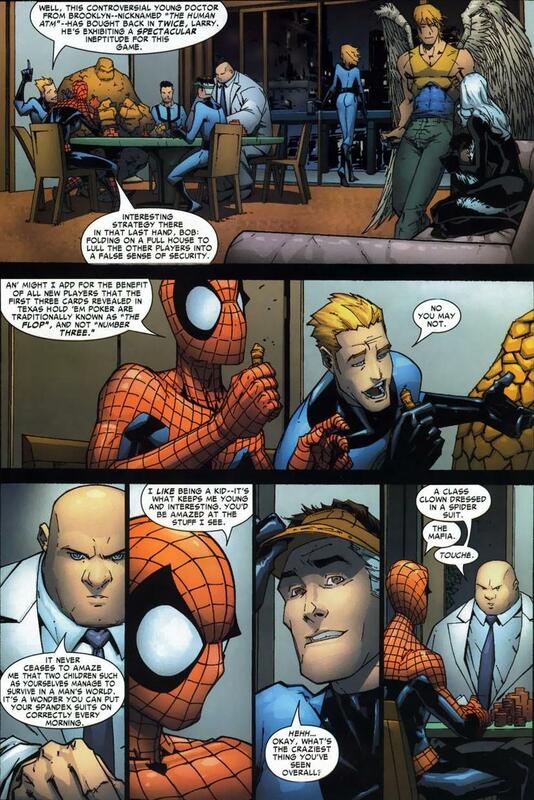 Forever hosted by the least cuddly of all superheroes, the Thing. You know the Thing. 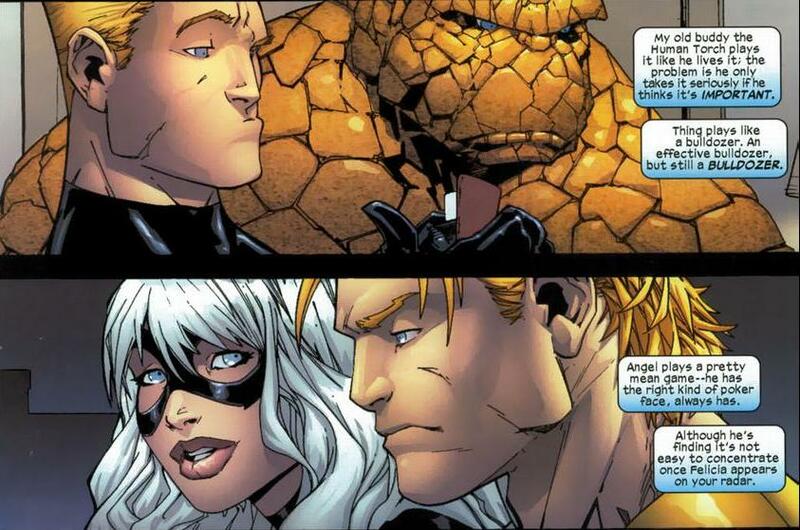 He’s part of the Fantastic Four and a big orange rock monster. But more of him in a later article. We’re going to follow along with one special game, and it’s absolutely delightful. Yup, the patrols have all wrapped up, the criminals are all locked up, and it’s time to kick back with your superbuddies. 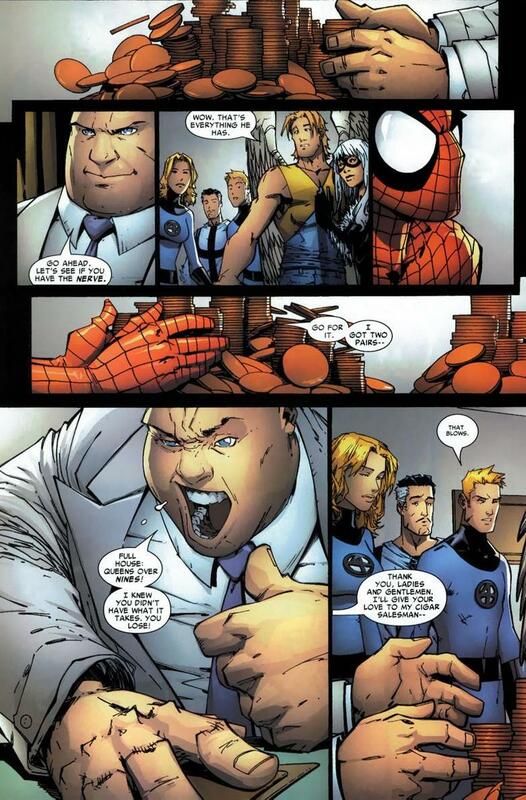 In Spectacular Spider-Man #21, written by Paul Jenkins, we enjoy a fight where the only thing that bruising and blood spilling would hurt are good vibes and good times. 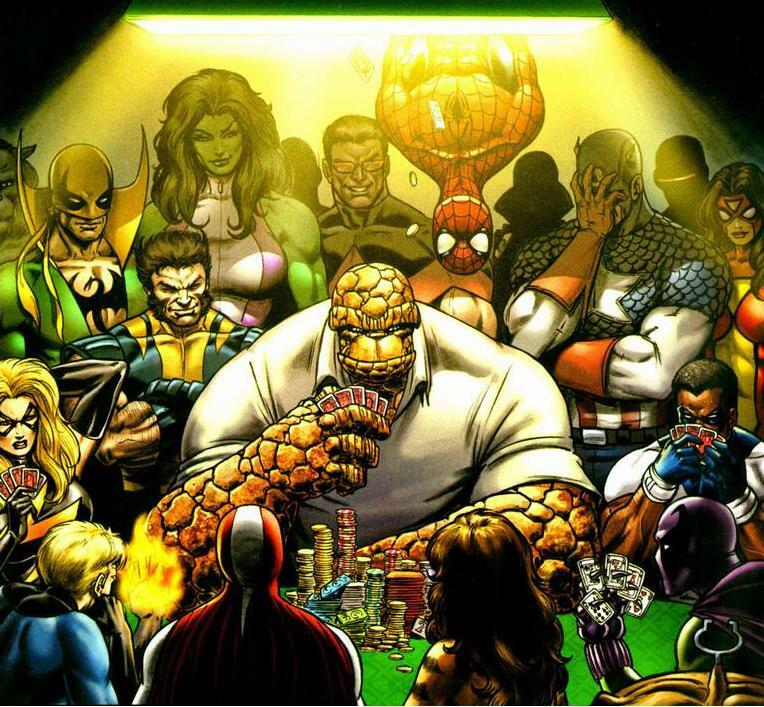 But you can’t sell an issue entirely on a card game where superheroes spend all 20 pages busting each other’s balls. No, good sales require tension, excitement, and a little suspense. Don’t you worry your little heads. Just because not a single punch is thrown in this issue, it has all the excitement any normal Spider-Man adventure would have. I know the Kingpin has been a prominent player in my articles recently, but this isn’t the cruel and manipulative Kingpin that haunts the nightmares of law abiding citizens. Nope, this is just a man of questionably moral character attempting to defeat the good guys in a competition where he finally has the upper hand. See? Stakes are high. Even with the addition of the top mobster in New York City, the happy mood mellows on. Besides, superheroes are used to being in high pressure situations. All the exciting poker action you see live on TV! Put forty pounds and sunglasses on the superheroes and you’d be unable to tell the difference. By the way, isn’t it nice to see superheroes use their powers for stuff other than pounding evil? 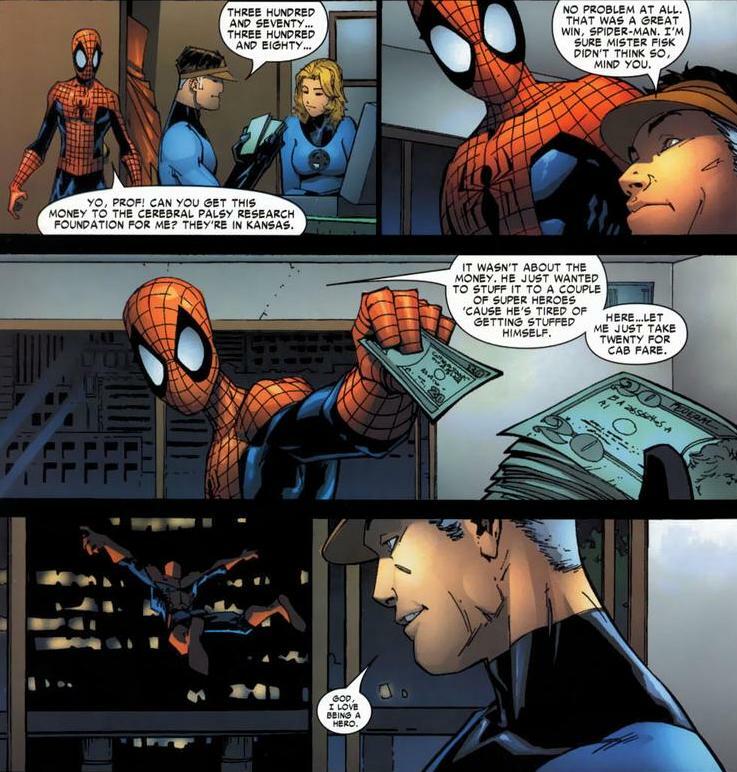 Spider-Man practically cheats with his spider-sense anyway. Plus, it’s like a sneak peek at the conversations we would have if we wore costumes, fought crime, and had magical adventures. 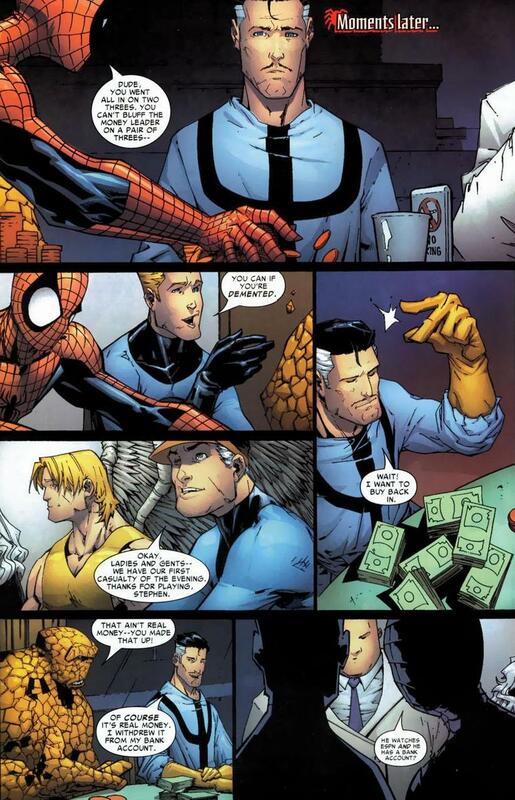 You know why superheroes always hang out with one another? 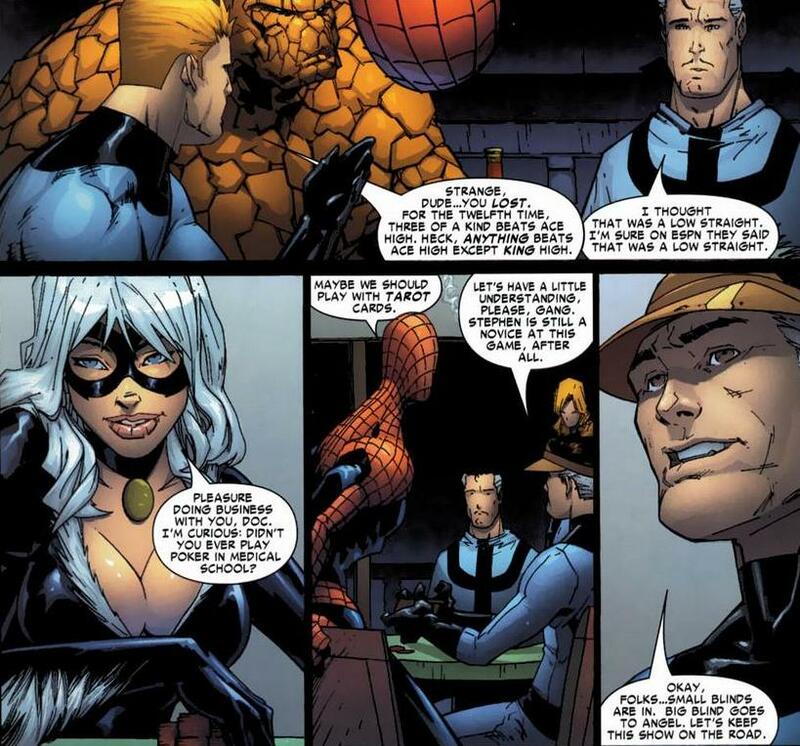 Because after a day of stopping an alien invasion and taking out a squad of robbers dressed like zoo animals, who could talk about “normal” stuff? Oh, the salad you had for lunch was a little dry, I’m sorry, I’m just a little tired today after toppling an empire in the microuniverse. Finally, the table is down to the final two. 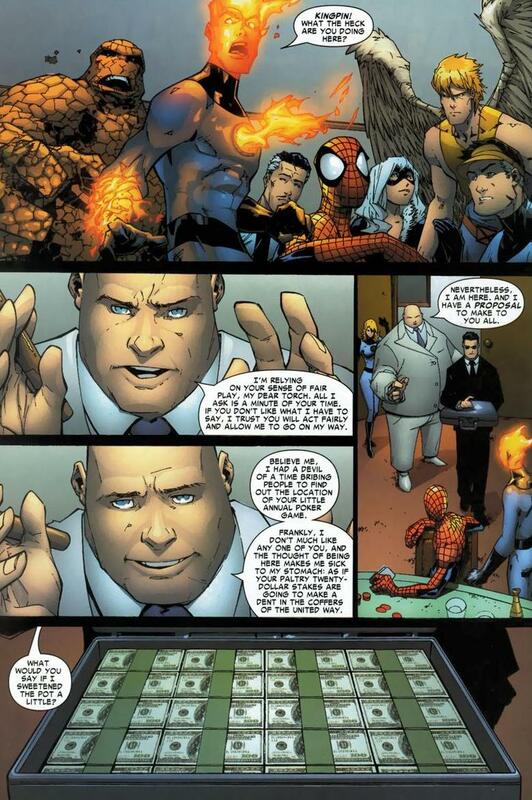 Our selfless hero Spider-Man versus a somewhat good natured Kingpin. Ready for the final showdown? Are you sitting down for the last hand of the game? You probably are, because you’re reading this on your computer. Let’s not delay anymore. You don’t need my commentary to watch this brutal battle unfold and see who ultimately claims victory. Yay for the good guys! 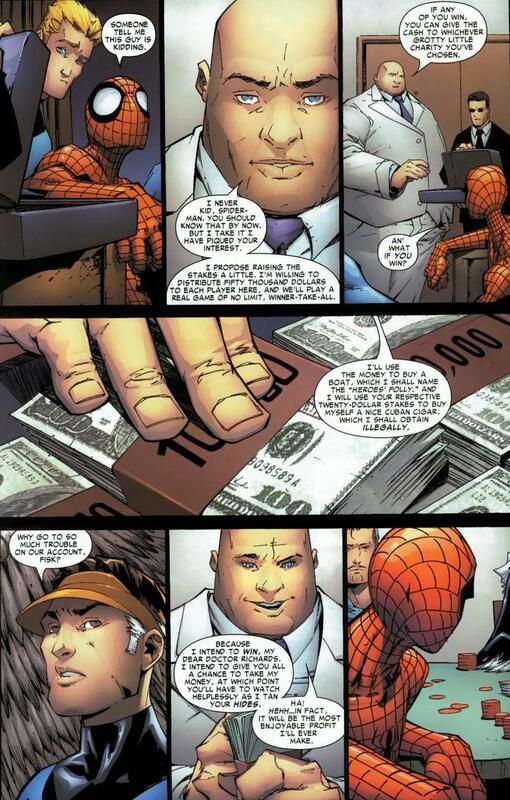 Though to be fair, the Kingpin will probably just claim the money as a tax write-off anyway. Charity and all. Because despite the obvious outcome, bad guys have to lose. 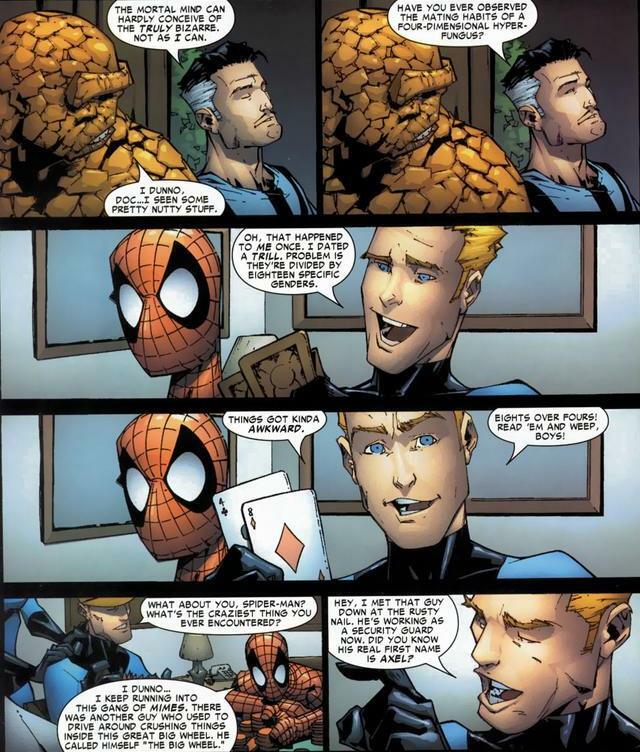 Whether it’s fistfights, races, or card games, being a villain means you’re not going to win. That’s why we read superhero comics in the first place. Good triumphing over evil and all that jazz. Now go finish that report. 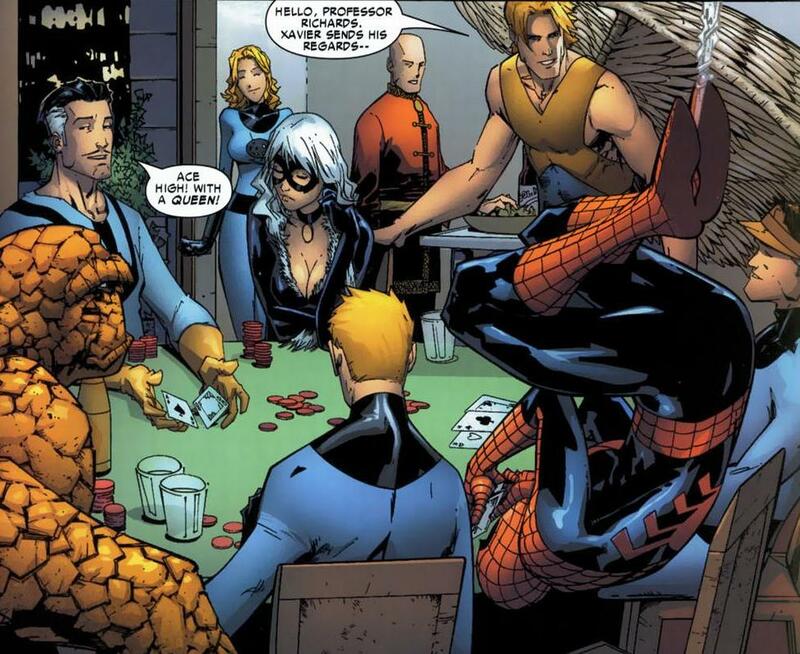 But remember, even Spider-Man takes time out after work to meet up with his friends. Or Netflix. I’m not really sure what he does. Most of his issues are him dodging punches. 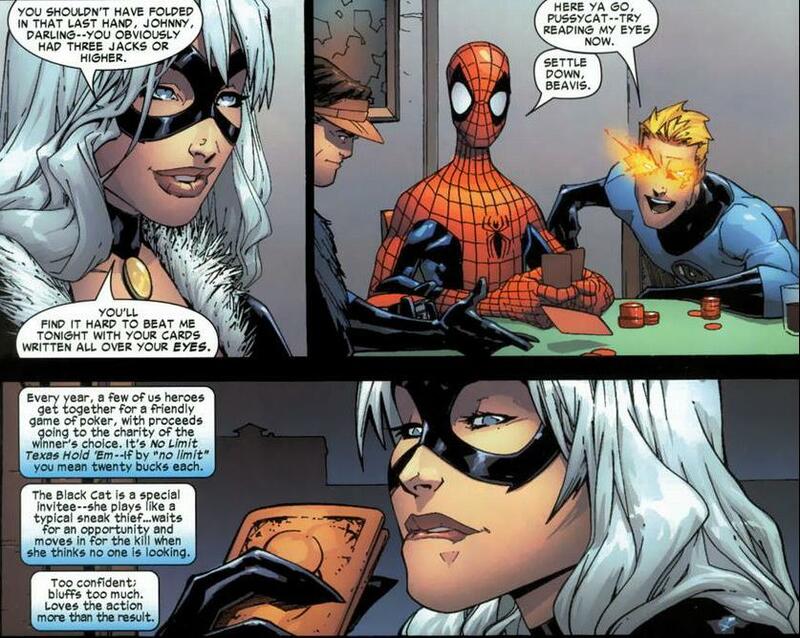 Why in the hell would anyone invite Black Cat? Not only would she cheat, but her bad luck power would give her a major unfair advantage. 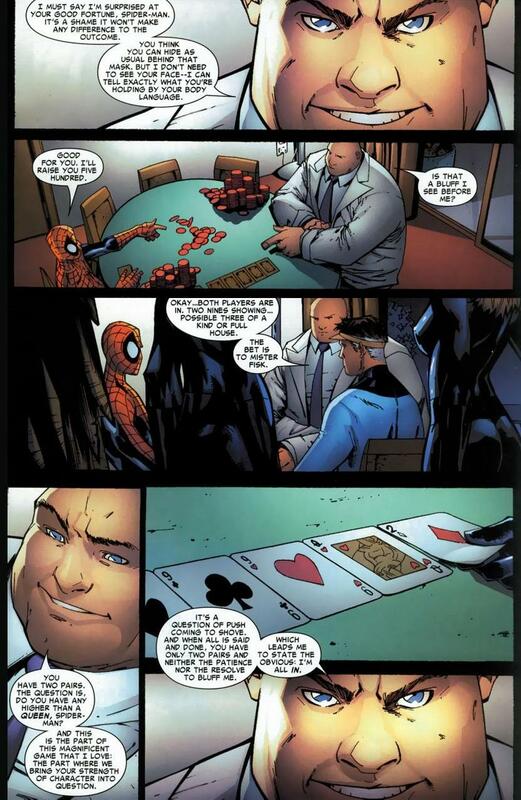 As for Spidey’s sense, I had no idea that his power would actually let him know if someone was bluffing. I though his power only buzzes in the presence of actual physical harm. 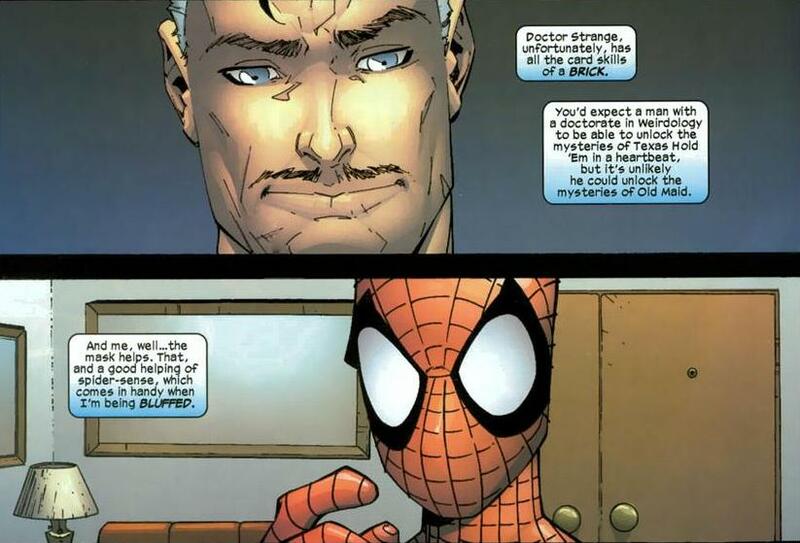 Then again, his spider-sense has been written so nebulously over the years that most writers just make it do what they want it to do. You’re absolutely right. 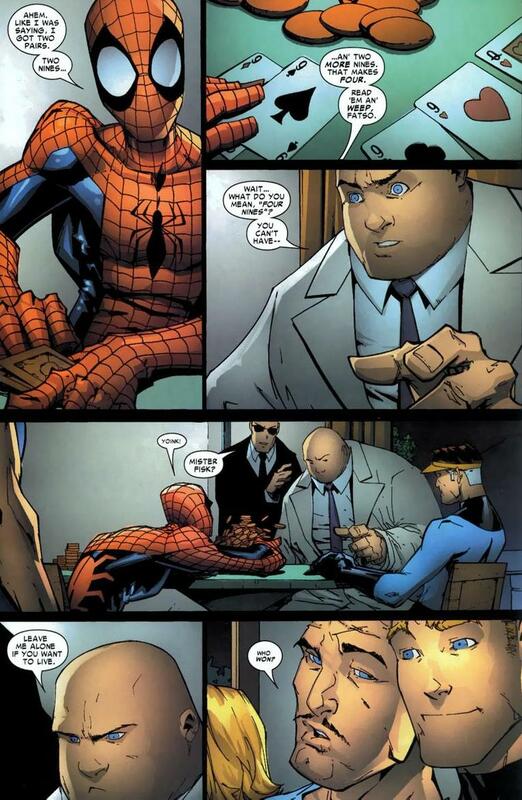 I always figured Spider-Sense worked like magic and technology did in the Marvel universe — it does whatever the writer wishes.